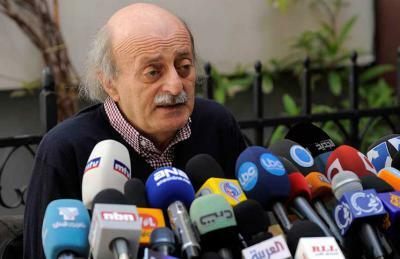 Walid Jumblatt speaks to the press after negotiations with Jabhat a-Nusra. None of the terms of that agreement have been applied in practice according to the Druze of Jabal al Summaq.Photo courtesy of Al-Quds. The Jabal al-Summaq region in the Idlib province of northern Syria is home to nearly 18,000 Druze spread out amongst 18 villages, all of whom have been living under the control of Jabhat a-Nusra (JAN), (the Syrian Al Qaeda branch) for nearly two years. An offshoot of Islam, hardline Sunni groups such as JAN consider the Druze faith a form of heresy. Nusra gave the Druze in Idlib a choice: Convert or fight. They converted. Publicly, at least. “They claimed they were fighting infidels, and that we had to decide our own fate and our identity, to either be with the Muslims, or the infidels,” Abdul Majid Sherif, a resident and retired math teacher who currently works as the head of the Media Office of the Free Democrats Party of Idlib, tells Syria Direct’s Moatassim Jamal. This past February 1, JAN released a statement spelling out a series of obligations agreed to by Druze and JAN leaders in Jabal al-Summaq: The Druze would destroy their holy shrines, convert to Sunni Islam, force women to clothing Nusra believes to be in line with sharia law, among others. Q: How does Jabhat a-Nusra treat the Druze in Jabal a-Summaq? They treat us fairly for now. However don’t misinterpret what I’m saying as some form of propaganda; they only do so because we’ve agreed, at least on the surface, to comply with all their rules and regulations. We follow their orders so that they treat us well. After JN kicked the Islamic State (IS) out of Idlib, they told us that they wouldn’t protect us unless we converted to Sunni Islam, prayed and issued an official statement saying that we’ve left the Druze faith. As of now they have yet to attack us. As long as we appear to be following their rules, they consider us ‘brothers’ in Islam. Q: Did they ask that you destroy Druze shrines? Yes. They’ve forced us to comply with a number of orders and decrees, including the destruction of our shrines. They dug up the tombs of a number of our saints, however we didn’t protest. They forced our women to wear strict orthodox Islamic garb, and to give up their traditional Druze clothing. They’ve also threatened us saying that if the al-Hisbeh (sharia law) police found anyone on the street during prayer time, that that person be punished. Same for women who don’t follow the mandatory clothing requirements. The worst is what they’ve done in schools. On Monday, they arrived in our village and separated all the male and female students, insisting that they be taught separately, and only by teachers of the same gender. This has caused problems as we don’t have enough teachers to effectively accommodate these changes. For example we only had one math teacher, who was a female. There was no qualified male teacher that could replace her, so now the boys don’t study math. The opposite occurred with English classes. Our only English teacher is male, so now the girls don’t study English. Q: On March 2, Walid Jumblatt, a prominent Lebanese Druze politician and leader of the Progressive Socialist Party, engaged in negotiations with JAN in the hopes of easing some of these strict laws imposed by JAN. Allegedly JAN agreed to do so as long as the Druze continued to adhere to Sunni Islam. Did anything come of that? None of the terms of that agreement have been applied in practice, as far as we can tell. JAN continues to impose their strict interpretation of Islam upon us, forcing women to cover their faces, preventing men and women from mixing in public, and so forth. [The saying occurred when Mohammed sought to spread the word of Islam amongst non-believers in Mecca, some of whom supposedly offered him large sums of silver and gold to abandon his mission. In the above saying, the moon is representative of silver, and the sun of gold. It essentially means that Mohammad would not abandon his quest to proselytize for all the money in the world]. Q: What do the Druze in Idlib think about Jabhat a-Nusra and the laws they impose? We reject their laws in principle, but follow them in public. When it comes to solving disputes amongst ourselves we don’t bring our problems to Jabhat a-Nusra, we go to our sheikhs. Q: If you reject their rules, why have you decided to continue living under their protection? There’s nothing we can do. Those Druze who have left our villages had their property seized and confiscated, now they can never return. That’s why we’ve decided to stay here. Q: What was Jabhat a-Nusra’s justification for imposing their laws on the Druze? They claimed they were fighting infidels, and that we had to decide our own fate and our identity, to either be with the Muslims, or the infidels. Q: What is it the Druze fear most about Jabhat a-Nusra? There’s a lot that we fear. We fear that they might force our young men and women to marry outside the Druze faith. This could lead to the eventual destruction of our religion. They’re also attempting to promote polygamy among our young men, a practice we don’t support in our faith. We also fear their ideas about jihad. They believe that jihad is mandatory for all Muslims, and that as such those of us who have converted to the Sunni sect must take up arms and fight. Many of their local leaders (Syrians) are less strict about this. They appreciate the position we’re in, the fact that we’re neutral and don’t want to fight, and they often times exempt us from having to do so. However the foreign leaders are very strict. Abd al-Rahman al-Tunisi constantly issues laws and decrees of this nature. The local members serving underneath him make exceptions and exempt us from having to take part the fighting. Q: How do the FSA and other battalions treat the Druze in Jabal al-Summaq? FSA brigades also treated us well in the past, and tried to convince us to join with them previously saying they would protect us. However Jabhat a-Nusra is strong, so our leaders preferred that we remain under their protection. The FSA is weak, and with them we might end up being left on our own. Q: What is the future of your relationship with Jabhat a-Nusra? Despite everything we don’t believe that Jabhat a-Nusra will be around long. We can live with them for now until God frees us from their grasp. However if their rule were to last a long time, then all the previous things I mentioned would take effect permanently, that we wouldn’t be able to accept. Q: How do Druze leaders and sheikhs deal with this situation? Our leaders and sheikhs engage in negotiations with Nusra. Everything is done publicly, nothing is hidden. At the end of the day all they do is receive orders from Nusra and relay them to those in the villages. I suppose the women are used to ‘going along’ with whatever ‘style’ is in vogue by males. The males always seem to enforce one on the females, after all – more, less, lighter, darker … and the whole ‘Levant’ could be known as the ‘muffled east’, while the women seem to have accepted all that they ‘must do’ just to be there. The fake islamic lluciferian leaders in the persian gulf region should stop financing the dajjal soldiers in the leviant.